Summary: The Leteo Institute’s revolutionary memory-relief procedure seems too good to be true to Aaron Soto — miracle cure-alls don’t tend to pop up in the Bronx projects. But Aaron can’t forget how he’s grown up poor or how his friends aren’t always there for him. Like after his father committed suicide in their one bedroom apartment. Aaron has the support of his patient girlfriend, if not necessarily his distant brother and overworked mother, but it’s not enough. Review: Adam SIlvera brought me into Aaron’s world and twisted up my emotions. There were tears – multiple times. The characters were distinct and devastatingly realistic. The cover and title would imply that this is a happy book – and there is happiness to be found here, but there’s also a heap of unhappiness. Aaron is a teen who’s gone through some tough times and wants to remove them from his memory to make the pain stop. Anyone can probably understand the temptation to erase the painful bits of life. The book is about much more than that single decision though. Aaron is navigating relationships and searching for happiness where he can find it. He often finds it with his friends. Their laughter and love keep him going, but may not be enough. This is a book that you won’t want to miss. 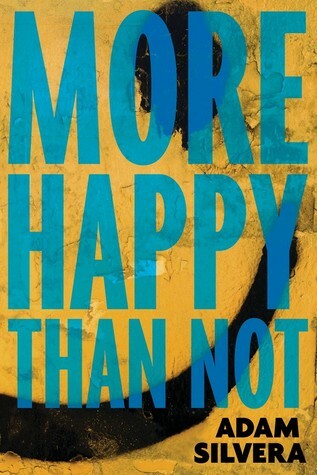 More Happy Than Not will be available soon and I hope you grab it.